The thoughts of backing up a big truck tends to be a little intimidating to people thinking of becoming a trucker. Don't worry about it. 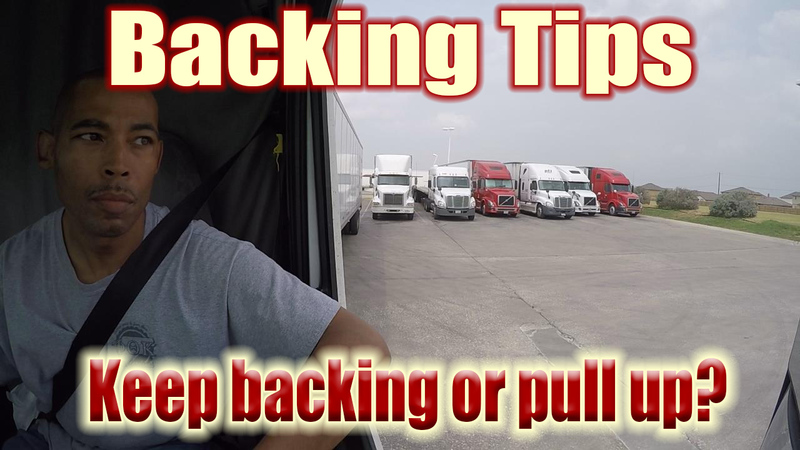 You will be taught backing up principles when you go through your training for CDL. If you should have difficulty, there is no need to worry, that is the case for most at first. Some catch on quickly and others take some time. Before backing at speed, barely move back for a few seconds. That way if any four wheelers are in your blind spot, they can move into your viewing area or out the way. Lol, don't pause for too long because drivers will rush you. If you are 100% sure nothing is on your blind side (if there is one) go with decisiveness. When I was in trucking school, there was a guy that no one thought would ever learn to back the tractor and trailer up. He failed several times before we ever left the class. When we left the class he was still trying to pass the backing test. I talked to one of his friends weeks later and found out that he was driving for USA Truck. Even he eventually learned to back up the truck and soon after got a trucking job. Too close to the line. How should he correct? Many incidents or accidents occur while new drivers are backing up. These tips for backing up are similar to tips for learning anything else new. Realize that you are normal. No one was borne knowing how to back up a big truck. Some pick it up quick, some take a little longer. Don't wonder if you can learn it, the answer is yes you can. How long it takes is how long it takes. Visualize yourself backing up like a pro. Touching no cones or hitting no curbs. You are backing it a straight line with no troubles. You are doing blind sides and 90 degree backing to the dock as well as parralel parking with no troubles. That is you. Imagine it down to the color of what you are wearing and the smell of deisel. Mentally prepare by telling yourself, "I will learn backing up just like I learned how to ride a bike, or like I learned to swim, or like I learn to drive a car for the first time." Think of all the new things that you have learned. This proves to yourself that it is doable. So assume already that you are able and it just takes going through the motions of perfecting the skill. Pay attention and be present. If you relax and focus on instruction, not on messing up or what if... you can pick up the process quicker from the trainer. Be aware of how much you turn and at what point in relationship to the positioning of the tractor and trailer. One thing you will notice is that there is a certain point at which small corrections will be easier to control than waiting late and having to do major corrections. Do not give up on yourself. Do not get discouraged. You will pick this up as long as you stay at it. It's a lot easier than you assume. It's only when you are anxious and rush that you miss a beat. Practice makes perfect so do it often. When you have free time practice. 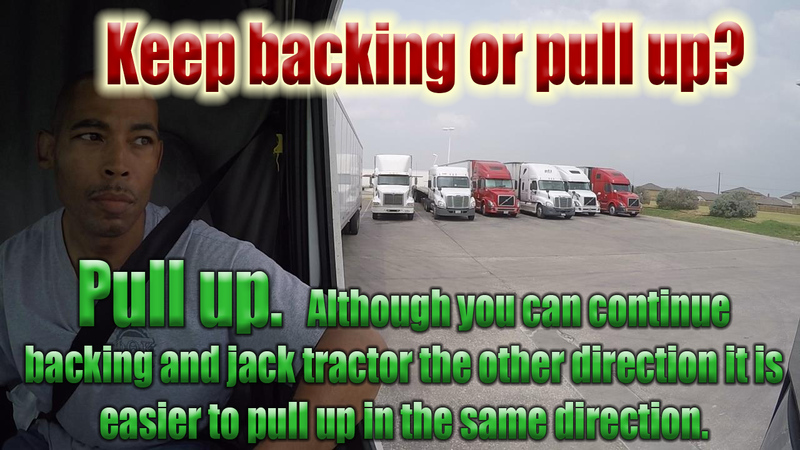 I don't know if they will let you do this at the trucking school but once you get on the road, if you are at the truck stop early or at a dock where no one minds, practice backing to the dock or into the parking space. Get out and look as often as needed. People may laugh, point, talk trash on the CD or just shake their heads. So what. They had to do the same thing when they started. Some of them still can't back up in tight situations, just look and you will see them. Never let what others may think of you being careful keep you from being careful. Get out and check as often as you need to. Just remember to pay attention so that you can constantly improve. You will eventually have to get out less and less. Many of these large companies will tell you to never back if you don't have to. Sometimes you can pull into a space but it is easier to back in and pull out then pull in and back out. Remember it is your responsibility when backing. Even when someone is back there supposedly helping you, if you doubt their help just get out and check. Also don't assume people that are standing by watching will actually stop you. They may just watch, as thing unfold. These days, they may even just break out the camera and hope that something happens! Share your tips, stories or ask your questions related to backing up a tractor trailer. What have you found to help you perfect your backing skills? My worry is backing the trailer in difficult places or really just backing up at all! Take your time and it will eventually become natural. when looking in the driver side mirror, if the trailer is out of sight turn the steering wheel to the right. some thing I learned fro cdl of ga.